Let the collections at Seurasaari Island and Open-Air Museum and Kansallisgalleria capture your imagination. 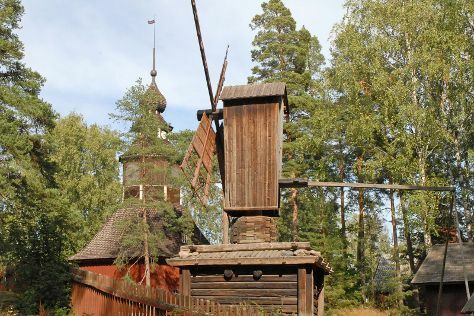 Langinkoski Imperial Fishing Lodge Museum and Kotka Church will appeal to history buffs. You'll find plenty of places to visit near Helsinki: Hiidenvuori (in Iitti), Cathedral of Porvoo (in Porvoo) and Arboretum Mustila (in Elimaki). Spend the 6th (Wed) exploring nature at Sipoonkorven Kansallispuisto. There's lots more to do: take a peaceful walk through Niivermaki Nature Conservation Area, trek along Santalahti Nature Trail, stroll the grounds of Hietaniemi Cemetery, and look for all kinds of wild species at Riverside Park. To see reviews, more things to do, other places to visit, and tourist information, read our Helsinki trip itinerary planner. Montreal, Canada to Helsinki is an approximately 13.5-hour flight. You can also do a combination of train and flight; or do a combination of bus and flight. Due to the time zone difference, you'll lose 7 hours traveling from Montreal to Helsinki. In March in Helsinki, expect temperatures between 3°C during the day and -5°C at night. Finish your sightseeing early on the 7th (Thu) so you can drive to Espoo. Espoo is the second largest city and municipality in Finland. Keep things going the next day: contemplate in the serene atmosphere at Lohjan Pyhan Laurin Kirkko the Church of St Lawrence Lohja and then kick back and relax at Bellevue Beach. To find other places to visit, where to stay, more things to do, and more tourist information, go to the Espoo trip builder site . Espoo is very close to Helsinki. In March, plan for daily highs up to 3°C, and evening lows to -5°C. Wrap up your sightseeing by early afternoon on the 10th (Sun) to allow enough time to travel back home.